The final quarter of 2018 was a volatile period for markets. In October there were steep falls around the world with Asia hardest hit. This reflected growing unease about trade disputes between the US and China, with neighbouring countries caught in the crossfire. November was a month of consolidation for most regions. Emerging markets rallied after a prolonged period under pressure, with China gaining 7.5%, while an end of month recovery for technology stocks helped the US indices finish in positive territory. 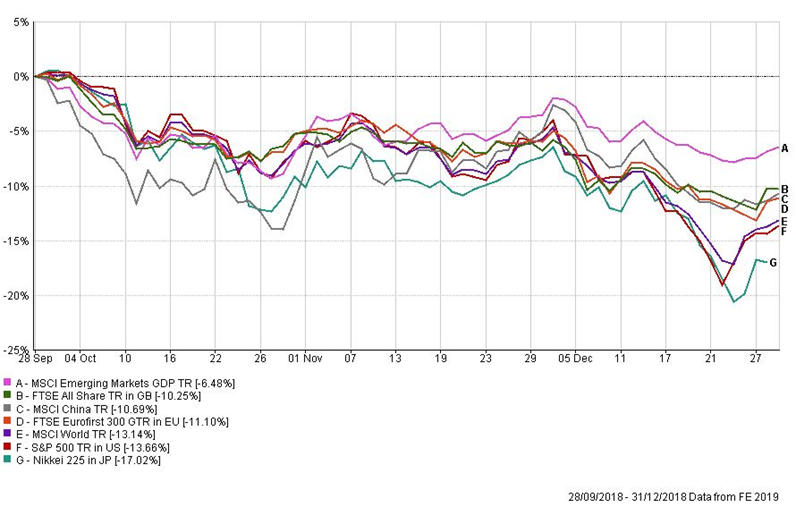 In Europe, most major markets were marginally lower, with politics rather than economics dictating moves. December brought little seasonal cheer. By the end of 2018 stock markets were in negative territory for the quarter and the year, with small cap indices falling the most. Investor sentiment has been depressed by worries that higher interest rates and bond yields will translate into lower growth, particularly in China. In the UK, a delay to a parliamentary vote on the proposed Brexit deal and a challenge to Theresa May’s leadership brought renewed weakness in the pound which has favoured large cap overseas earners ahead of domestically based stocks. This reduced losses for UK investors in overseas markets, if they left their positions unhedged. Growth stocks, in particular technology, came under selling pressure but cyclicals were also affected, leaving only defensives holding up relatively well. Despite the recent setback, technology stocks were the top performers for the year, albeit significantly down from their peak in June. Government bonds provided small positive returns due to their safe haven status. Volatility extended to the oil price. Having touched $85 a barrel in early October, the highest level for nearly 4 years, the price of Brent crude fell by more than 30% over the next 3 months. US output exceeded expectation while OPEC production cuts and the US sanctions on Iran failed to curb excess supply. Additionally, demand has weakened. The rise of US interest rates has been a key influence on market direction. Hints from Federal Reserve Chair Jay Powell in November that they were close to neutral triggered a market rally but a further quarter point rise in December, the fourth of the year, prompted another sell-off. News on Donald Trump’s threatened tariffs was closely monitored. Trump and his Chinese counterpart entered negotiations at the G20 meeting in Argentina and announced a temporary truce which was cautiously welcomed. However, the arrest of a senior executive of Chinese tech company Huawei in Vancouver, relating to alleged violation of US sanctions against Iran, did not help. The Democrats regained control of the House of Representatives, increasing the potential for congressional gridlock. It gives them power to investigate criminal allegations (including Russian involvement in Trump’s election win) against the Administration and could expedite the start of any impeachment action. The UK appeared to be on course for a compromise Brexit in early December but it soon become clear this would not be approved by Parliament and Mrs May’s subsequent decision to defer the vote plunged her into a leadership contest. In Europe, Angela Merkel is to step down as leader of the Christian Democrats after 18 years at the helm. Far right Vox party won its first seats in Spanish regional elections while Italy faced sanctions from the EU over its budget, which breaches spending rules. Meanwhile, French president Emmanuel Macron faced riots over a proposed fuel tax hike. The European Parliament approved the EU’s largest ever trade deal; the arrangement with Japan will remove more than €1bn in duties for European exporters while creating an open trade zone covering 630m people. Populist candidate Jair Bolsonaro clinched victory in Brazil’s presidential election with promises to tackle the protracted recession and corruption. His mandate includes privatising state owned enterprises, giving greater control to the Central Bank and reviewing an over-generous pension system. In its latest World Economic Outlook, published on 21st January, the International Monetary Fund (IMF) confirmed its expected growth outcome of 3.7% for 2018, despite weaker performance in Europe and Asia. However, it has pulled back forecasts for 2019 to 3.5% and 2020 to 3.6%, downgrades of 0.2% and 0.1% respectively. The latest revisions reflect softer momentum in the second half of 2018, particularly in Germany following the introduction of new fuel emission standards, and in Italy where sovereign and financial risks have dampened domestic demand. Furthermore, financial market sentiment has deteriorated and the contraction in Turkey is likely to be worse than expected. The impact of tariff increases in the United States and China had been factored into October’s release. However, any escalation in trade tensions remain a key risk to growth prospects along with a no-deal withdrawal of the United Kingdom from the European Union and a greater-than-anticipated slowdown in China. The IMF forecasts growth of 1.5% in 2019 and 1.6% in 2020 which assumes a Brexit deal is reached this year. The high degree of uncertainty has overshadowed the positive contribution from fiscal stimulus announced in the 2019 budget. Using its new measure of rolling growth, the Office for National Statistics (ONS), reported GDP growth of 0.6% in the 3 months to October, as the tailwind of good summer weather waned. This is expected to slip further in the final quarter but full year growth should come in at 1.3-1.5%, not too far below the Bank of England forecast of 1.7% and ahead of the forecast in the Autumn Budget. The IMF expects 1.4%. Manufacturing and construction activity has picked up, yet High Streets are facing the toughest trading conditions in 5 years. Slightly better manufacturing activity in November, was attributed to stockpiling ahead of Brexit. Export demand, on the other hand, has been weak. Despite unemployment falling further, to 4.1% in November, there have been three successive quarters of declining business investment as companies remain reluctant to commit until the Brexit path is clearer. Car production, for example, fell by almost 10% in October, as sales declined in the UK and mainland Europe. The possibility of an interest rate rise reduced as inflationary pressures diminished, with the CPI standing at 2.3% in November. There are tentative signs of real wage growth which should assist consumer confidence and spending, as well as improving affordability in the housing market. Corporate earnings have been surprisingly good overall though the outcome of Brexit and subsequent direction of the pound will be a key determinant of which sectors perform best going forward. At the start of 2018, it had seemed a choice between a ‘hard’ or ‘soft’ Brexit. By the summer this had shifted towards ‘deal’ versus ‘no deal’. As we write, several scenarios are still possible, including no deal, an amended version of Mrs May’s deal, a second referendum, or even the unilateral revoking of Article 50. The Chequers plan, proposing a free trade deal and frictionless borders, is favoured by manufacturers. The risk of a hard or no deal Brexit has kept the pound under pressure. In summary, for the UK, 2019 looks set to be another year of political drama, leaving UK investors facing a conundrum. A resolution to the current impasse should be good for the economy overall and domestic companies, but could present more of a challenge for internationally focused UK shares and gilts. The IMF has held its US GDP forecasts. Growth will slow to 2.5% for 2019 and 1.8% for 2020 as fiscal stimulus abates and interest rates temporarily exceed the neutral level. The US economy has been the main driver for world growth this year following President Trump’s fiscal boost. However, there are some signs of slowdown in areas such as housing and industrial production although, with full employment, consumer confidence remains robust. Manufacturing slowed in October then came to a halt in November due to a combination of weaker global demand and a strong dollar. A deterioration in forward looking purchasing manager’s surveys suggests last year’s stellar earnings growth, in excess of 20%, will not be sustained in 2019, with a slowdown to high single digit anticipated. Investors have been unnerved by a number of weaker than expected earnings reports, including bell-weathers like Caterpillar. Tech stocks were caught in the barrage of negative news, led down by Apple which issued its first profits warning in 16 years on the back of lower iphone demand in China. New Federal Reserve Chair, Jay Powell, quickly made his mark, with monetary policy tightened over the course of the year. US Treasury yields jumped in October after employment figures beat expectations, leading Powell to declare that US interest rates were still ‘a long way from neutral’. This put equities under pressure. However, just a month later he appeared to moderate his stance, putting further rate hikes in 2019 in doubt. The IMF has reduced growth forecasts further for the euro area, to 1.6% in 2019 and 1.7% in 2020. Growth has moderated in the key economies, notably Germany (lower industrial production and weaker domestic and foreign demand); Italy (weak domestic demand and higher borrowing costs); and France (effects of protests and industrial action). GDP growth in the Eurozone slowed to 0.2% in the third quarter, and the latest PMIs imply just 0.1% for the final quarter. The IHS Markit Eurozone Composite PMI fell to a 4-year low in November, with manufacturing the main area of weakness, but services also starting to see a slowdown. In addition, the ZEW Indicator of Economic Sentiment for Germany remained firmly in in negative territory in November and economic growth has decelerated significantly. Germany accounts for about one-third of the euro-zone economy, so its performance is key. There are two possible explanations for the slowdown. Some economists attribute it to mean reversion following an exceptionally strong 2017, compounded by poor financial conditions in Italy and the impact on European automotive production from new EU regulations for emissions standards. Others blame it on the damage that global trade tensions have done to economies powered by exports which have been hurt by weaker global demand. Despite this setback ECB President Mario Draghi has reiterated his intention to join most other Central Banks in halting the quantitative easing programme. A pick-up in inflation could be the catalyst for this and should be good news for the beleaguered financial sector. The IMF has revised up slightly its growth estimate for Japan to 1.1% for 2019, and 0.5% in 2020 (+0.2% for each year). This revision is largely due to additional fiscal support to the economy, including measures to mitigate the effects of the planned consumption tax rate increase in October 2019. The Japanese economy has managed to weather natural disasters and softening external demand in 2018, thanks to a strong domestic performance. The picture has been more mixed for the important export sector with strong growth of 8.2% in October, followed by negligible growth in November. The economy contracted in the third quarter as real GDP growth fell by 0.3%, quarter on quarter, but it is forecast to rebound into positive territory in the final quarter, helped by reconstruction spending. While economic growth may have been lacklustre, the corporate sector paints a different picture with profits and earnings growth consistently beating expectations. Improved corporate governance is releasing value to shareholders, as cash rich companies return money to shareholders via dividends and share buybacks. Japan offers a relatively stable political background. Having secured his third term as the Liberal Democratic Party leader, Prime Minister Abe’s term does not end until 2021. Nonetheless, 2019 sees local government elections in April and upper house elections in July which could mean delays to structural reform. Abe’s reform programme has encouraged employment of women, older personnel and immigrant workers. This addresses the ageing demographic, along with greater use of automation and outsourcing of manufacturing to China. Other challenges include the scheduled consumption tax hike and potential escalation of US protectionism, notably auto tariffs. However, any negative impact should be offset by continued labour market strength, strong corporate profitability, and various fiscal measures underway including social security enhancements, cash subsidies, and infrastructure projects. The undershooting of its 2% inflation target has prevented the Bank of Japan from tightening monetary policy. Japan is cheap on most valuation metrics in both absolute and relative terms. Growth sectors such as robotics and healthcare produce world leading products yet frequently trade on attractive valuations relative to their counterparts in other developed markets. For the emerging market and developing economy group, growth is expected to edge down to 4.5% in 2019 then pick up to 4.9% in 2020. China will be hurt by financial regulatory tightening and ongoing trade conflicts. On the other hand India will benefit from lower oil prices and a slower pace of monetary tightening. In Latin America, growth is projected to recover over the next two years. Emerging markets overall look attractively valued, especially in Asia, but are a diverse grouping with varied drivers and headwinds. For the all-important Chinese economy, it became clear, as the year progressed, that the dispute with the US goes beyond trade to include diplomatic matters. China’s industrial production was below forecast in November and car sales were down over 10% year on year. There has also been a slowdown in infrastructure investment as the government moderated its stimulus programme. However, it is hoped the authorities will launch new measures to shore up growth, including monetary stimulus and easing access for imports to domestic markets. The latter is already evident in the recent relaxation of tariffs on car imports. Although the Central Bank has taken action to increase confidence in its reform programme, growth of 6.4% for the fourth quarter was the slowest for a decade. Furthermore, retail sales grew at their slowest for 15 years. Although exports have held up reasonably well, subdued consumer spending and a slowdown in housing construction is clearly hurting the domestic economy. On a brighter note, Chinese consumer sentiment improved in November after 3 consecutive months of decline, with households more optimistic about financial conditions and the economy. The FTCR China Consumer confidence index rose to 72.5 in November while the Economic Sentiment index improved to 70 although the impact of trade wars may still to have an effect. India held up well over the quarter, as it tends to be a beneficiary of lower oil prices, despite some caution ahead of this year’s election. The country retains its status as the fastest growing large economy, with business friendly government policies supporting entrepreneurial companies. Elsewhere, the strength of economic recovery in Latin American will depend partly on the success of policies implemented by new political leaders in Brazil and Mexico. Any reversal in dollar strength would be helpful for countries whose currencies have been under pressure, notably Turkey and Argentina. Although the economic cycle is ageing, forecast growth of around 3.5% this year would be respectable, and recession seems unlikely at this juncture, with the dominant US economy still healthy. Higher wages may push up inflation a little but it remains low by historic standards. While global debt has grown significantly since 2008, on the back of cheap finance, the financial system is in much better shape. Although the IMF has expressed some concern about global growth sustainability, many companies remain upbeat. What is clear is that when investors become nervous about growth, it is growth stocks that suffer most. Technology has been hardest hit, yet the structural drivers remain valid. Companies with low debt, high and defendable margins and stable earnings continue to thrive while those which disappoint are harshly punished. Market volatility is part and parcel of investing and after returning with vengeance in 2018, is likely to continue. The value style has performed well in recent months, despite being linked to the health of the domestic economy, as we transition from an environment of cheap debt to one where economic and corporate fundamentals have a greater impact. The current reluctance of companies to invest, and consumers to spend, may lead investors to favour large cap defensive companies but the dilemma is that these do look expensive compared to cyclicals, particularly in the UK. Following the Q4 setback, equities are on more attractive valuations. The UK, particularly domestically focused companies, and Japan look cheapest among developed markets, albeit not without some risk. Some emerging markets are on the lowest valuations since the financial crisis. Even the PE ratio for the US S&P 500, which deservedly commands a premium for its inherent growth characteristics, has fallen back below its 5 year average. As we often say, the stock market is a different beast to the economy and tends to discount outcomes, albeit not always accurately, in advance. It is therefore possible that much of the bad news is already reflected in share prices and, if some of the uncertainties are resolved, shares could offer decent upside potential. Losing your nerve and selling during market corrections, means you risk losing out in the rallies that often follow. For income seekers, attractive dividend yields are available from shares, which are well covered by earnings and tend to follow a smoother path than stock market returns. In most regions, yields exceed those available on bonds which lack the potential for capital growth. Only long dated US Treasuries offer a superior yield to equities. Naturally, fixed income should play a role in diversified portfolios, but it is important to be selective and perhaps consider alternative investments such as infrastructure or property. In conclusion, while slowing global growth and heightened volatility may not seem the most cheerful backdrop, it is times like these that often prove to be good entry points for long-term investors. Of course, while value may be present, we cannot predict exactly when this will be recognized in share price moves and patience is required. Meanwhile, it is sensible to build a portfolio that is well-diversified by asset class, geography and style factors.